These Slow Cooker Chicken Wings are cooked in a tasty Honey BBQ sauce until fall off the bone tender. 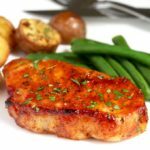 Quickly broiled until golden then served smothered in more sauce! 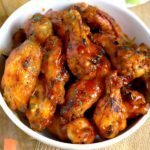 These crock pot chicken wings are always a crowd pleaser! My love for chicken wings grows stronger each year! I fell in love with the oven method used in this Sweet and Spicy Asian Chicken Wings. Talk about extra crispy and crunchy wings without any deep frying! 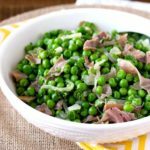 I also love recipes you can just toss and dump into a slow cooker while you get the opportunity to get other things done (or take a nap! I am always looking for ways to incorporate naps into my daily routine). These Honey BBQ Slow Cooker Chicken Wings come together very quickly. The spice mix uses ingredients you already have at home and the sauce has only 4 ingredients! Winner-winner-chicken-wings-dinner! First, pat dry your wings so the seasoning mix sticks to the chicken. Season the wings and add the sauce. Cook on LOW for 3 to 4 hours or on HIGH for 2 hours. At this point, they are ready to be devoured. The chicken has absorbed all the flavors and the wings are finger-licking good! BUT if you want golden and crispy wings, you can quickly broil them in the oven. Let’s break this down – I line the sheet pan with aluminum foil for easy cleaning. I place a cooling rack on top so the wings stay elevated (important when you have sweet sauces like BBQ that can burn easily due to sugar content) AND most important the rack helps to get hot air circulating evenly. 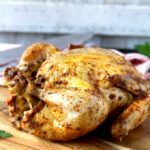 Can I Cook Frozen Chicken Wings in a Slow Cooker? How Long Does It Take to Cook Frozen Chicken Wings in a Slow Cooker? From frozen, cook the wings for 3-4 hours on HIGH or 5-6 hours on LOW. Serve these Honey BBQ Slow Cooker Chicken Wings with celery and carrot sticks and Ranch sauce for dipping. 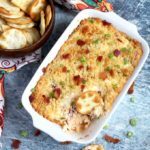 Need other appetizer or game night ideas? Check these out! 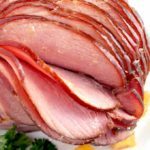 My friend Amy from House of Nash Eats has an amazing website and makes some of the most delicious recipes. Amy has prepared a healthier version of one of the most popular dips at any party – Hot Spinach and Artichoke Dip – yum! WANT TO TRY THESE HONEY BBQ SLOW COOKER CHICKEN WINGS? 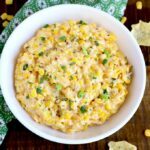 PIN IT TO YOUR APPETIZER BOARD TO MAKE IT LATER!! In a small bowl, combine the spice mix ingredients. Place the chicken wings in the slow cooker and sprinkle the spice mix over the wings. Toss making sure all the wings get well coated with the spices. Into a small bowl, add the Honey BBQ sauce ingredients and whisk until well combined. Pour the sauce mixture over the wings and toss. You want to make sure all the wings are coated with the sauce. 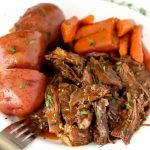 Cover the slow cooker and cook for 2 hours on HIGH or 3-4 hours on LOW. At this point the wings are cooked through and can be served. However, you can follow the instructions for broiling the wings to achieve a crispy/golden wing. THE SAUCE: If you wish to make the sauce a bit thicker, mix the cornstarch with cold water (about 1-2 tablespoons). Stir in the cornstarch slurry into the sauce and turn the crock pot to high for 10 minutes. Line a baking sheet with aluminum foil and place a cooling rack on top (you may need 2 baking sheets or you can broil them in batches). Place the cooked wings on the cooling rack making sure they are not touching so they can brown more evenly. Set your oven to broil* and BROIL the wings for 2-3 minutes or until golden brown. Carefully flip the wings and BROIL them for another 2-3 minutes. In the meantime, after removing all the wings from the slow cooker, mix the cornstarch with 2 tablespoons of water to make a slurry. 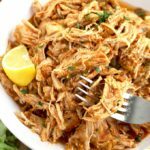 Add the cornstarch mixture into the slow cooker and mix it well with the Honey BBQ sauce until it is well combined.. Cook on HIGH for 15 - 20 minutes. The sauce will thicken a little bit. You can return the wings to the slow cooker and gently toss them until they are all well coated with the sauce and serve them with extra sauce on the side OR you can place the wings in a serving bowl and serve with the sauce on the side. * To Broil your oven racks should be set 3 - 4 inches from the heating element. The cornstarch is used only if you want to make the sauce thicker. If you are happy with the sauce consistency, skip it. These are phenomenal! I may have to make a triple batch and have 3 crockpots going! So ggod. wow coming over from Share group these are mouth watering cant wait to try them from Whats Cookin! Yummy yummy yummy! These wings are delicious. I have made them several times and they always go fast. These are the best wings. It was a big hit at our holiday party. Thank you for the recipe. Any idea on how long to cook them if I wanted to make a half batch? How long should they cook for a half batch? Hi Will! Same time as written in the recipe. I made this recipe for the Super Bowl and it’s a real winner. I highly recommend it! Thank you Michael! So glad you enjoyed it!